DeSean Jackson: Another Freddie Mitcehll? Does DeSean Jackson's 2008 Rookie Photo Day Video (discovered by Inside the Iggles) bring back bad memories of Freddie Mitchell? Watching the video one can't help but think how stupid Jackson looks and sounds. Throughout his interview Jackson is constantly praising his abilities and displaying the "look at me" personality that too often characterized Freddie Mitchell. When Jackson wasn't spewing compliments over his abilities, he was saying moronic statements like playing cornerback for the Eagles and being a shutdown corner like Deion Sanders. And Jackson sure won’t win any points with Eagles fans by constantly mentioning his idolization of Emmitt Smith, Troy Aikman, and Michael Irvin. Memo to Jackson: Philadelphia hates the Cowboys! 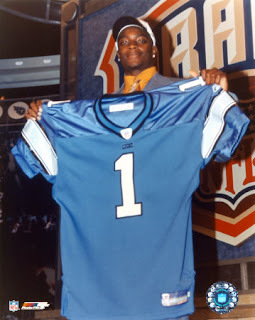 In the weeks leading up to the draft Jackson was seen being mentored by the legendary Jerry Rice. I guess Jackson did not learn the all-important lesson of letting your play speak for your greatness. Hopefully Jackson has gotten this behavior out of his system. Future interviews like this will not be tolerated by Eagles fans or by Andy Reid. Jackson: Before you start comparing yourself to Panther’s receiver Steve Smith, lets first get yourself on the field and make a few catches. Right now the only player you are being compared to is Freddie Mitchell. And that is not a good thing. NFL.com profiles the Top 10 Weather Games in NFL History and guess which game showed up on the list? Of course is was the Fog Bowl, the 1988 NFC Divisional Playoff Game between the Bears and the Eagles. It is one of the games that you will never forget as an Eagles fan. A great Eagles team could not overcome the foggy conditions and made yet another early playoff exit. Sporting News lists Andy Reid as one of ten coaches who are on the hot seat entering the 2008 season. Has Reid missed his best opportunities to capture a championship? Based on the Eagles missing the playoffs two of the past three seasons it is difficult to argue against Reid being on the list. Maybe a new voice, a new style is the change that the Eagles need. If the Eagles again miss the playoffs, could 2008 possibly be Reid's last season with the Eagles? Would Lurie actually end the Reid era? As stated in the article, it would probably take a dismal year for 2008 to be Reid's last. McNabb would most likely serve as the scapegoat if the team fails in 2008. Fox Sports thinks we should instead be erecting a statue of Reid outside the Linc. 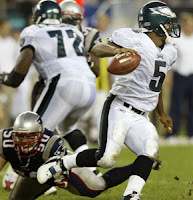 McNabb provides his assessment of the Eagles championship chances as they enter the 2008 season. "I think the window is stuck. It's not closed, and it's not open anymore," says McNabb, who's been trying to get through that vexing window since he became the team's starting quarterback. "We all have to kind of squeeze through and get the job done." Check out the Eagles preview in USA Today. The article closes by mentioning Kolb leading the team if the Eagles get off to a slow start. In todays USA Today the paper ranks the top offensive lineman in the game versus the best players of the "Super Bowl Era." Right Guard Shawn Andrews pulls down a number four ranking. No other lineman from the NFC East received a higher ranking. USA Today is doing an on going list of the best players of today versus the best players of the "Super Bowl Era." The first position analyzed is cornerback. And guess who showed up in the number three position...the Eagles new cornerback Asante Samuel. The Eagles look very wise with their off-season signing. I wonder if any other Eagles will crack the lists? I guess Wes Welker won't be predicting the Eagles to make a Super Bowl run this year. As reported in the USA Today, Wes Welker responded to the Samuel signing by saying "He chose money over championships, and that's the way it goes sometimes." You can understand Wes Welker being upset with the Patriots for not resigning Asante Samuel, but there is no need to attack the Eagles. Last time we checked Walker is still without a Super Bowl ring. 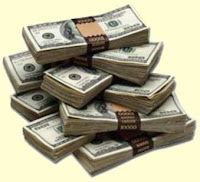 Time for the Eagles to Show Them The Money! During the off-season we have heard about the unhappiness of Lito Sheppard and Brian Westbrook with their current contracts. Westbrook is the Eagles' most valuable player, their top offensive star, one of the best all around backs in the league. Sheppard, when healthy, is one of the few Pro Bowlers on the Eagles defense. Sheppard is a shut-down corner, with a knack for interceptions and the big play. The more valuable you are, the higher your salary, right? Not with the Eagles. For the 2008 season Westbrook will be the Eagles 5th highest paid player and Sheppard the 10th. Westbrook makes only $184,720 more than LJ Smith, while Sheppard makes $5,688,280 less than Samuel. It is easy to understand their contract gripes. The Eagles, with plenty of money under the cap, should reward their stars. The 2007 season is history. Only a few months until the kick-off of the 2008 season. Will the Cowboys again rule the NFC East or can the Eagles make a jump back to the top? Off-season changes will go a long way in determining the success of each team in 2008. Here's a look a my top ten player additions to the division based on their potential impact. Sporting News released their team rankings of wide receivers in the NFC. Despite the constant outcries to upgrade the position, the Eagles pulled in a number 6 ranking out of 16 teams. Not surprisingly the Eagles did not land a receiver in the top 5 individual ranking of wide receivers. Ahead of the Eagles were NFC East rivals Giants and Cowboys. On the flip side, Sporting News has the Eagles cornerbacks ranked as number 1. So the Eagles should be able to negate the strength of their rivals. Another 8-8 Record - No Way! As the season approaches, so do the number of NFL predictions. A lot of the so-called experts are picking another mediocre season for the Eagles. A common predicted record for the Eagles in 2008 is 8-8 and out of the playoffs. In a review of the schedule it is difficult to see how the Eagles do not win at least 9 games, maybe even 10. But who really knows...no one knew the Giants would win it all last year. Can the 2008 Philadelphia Eagles be this year’s worst to first team? In 2007, the last place teams were the Eagles, Bears, Rams, Ravens, Falcons, Raiders, Texans, and Dolphins. Since 2002, at least one team each year has made the turnaround from basement dwellers to division champs. Since Andy Reid has been head coach, the Eagles have not gone back-to-back seasons without making the playoffs. Both are good signs for a turnaround. Compared to the other teams that finished in last place in 2007, the Eagles appear to be the logical choice. I am not saying that the Eagles will be hosting the Lombardi Trophy in February, but a first-place division finish and a return to the playoffs is not out of the question. The Eagles finished the 2007 season ranked in the league’s top 10 in three key offensive categories. The offense was sixth overall in total yards, 10th in passing yards, and eighth in rushing yards. The numbers show a pretty dynamic offense. The strong results should continue as Thomas Tapeh is the only offensive starter not retuning. The one area of constant struggle was red-zone efficiency. The Eagles had no difficulty marching down the field, but once inside the twenty, they stumbled. The Eagles ranked near the bottom of the league in scoring in 2007, finishing seventeenth in points scored. Red-zone efficiency should be improved with the return to health of Donovan McNabb and L.J. Smith, the addition of Lorenzo Booker, and improved starting field-position from Jackson’s addition to the return unit. The Eagles' defense also posted impressive numbers during the 2007 season. Like the offense, the defense ranked in the league’s top 10 in three key defensive categories. The defense was ninth in points allowed, 10th in yards against, and seventh in rushing-yards allowed. The area of weakness for the defense was their inability to create turnovers and create consistent pressure on the opposing quarterback. The Eagles finished the season with a paltry 11 interceptions and a mediocre 37 sacks. Insert Asante Samuel and Chris Clemons into the Eagles' defense. 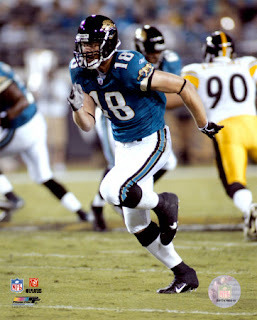 Samuel alone had six interceptions in 2007 and 10 interceptions in 2006. In limited action with the Raiders in 2007, Clemons posted eight quarterback sacks. Increased pressure on the quarterback leads to hurried passes. Hurried passes are inaccurate and should result in more interceptions. Better coverage from your secondary leads to more time for the ends to rush the quarterback. More time to pressure the quarterback results in more sacks. Looking back and looking forward, the case is there for the Eagles to make the jump to the top. Yes Eagles' fans the last time the Eagles were Champions was in 1960. Oh the years we have suffered. Lisa Hann details the last Eagles championship with interviews from Chuck Weber, Marion Campbell, and Chuck Bednarik. It’s no longer at the corner of 62 Street and Walnut, but Bill Barnes will never forget Donahue’s. It was that closeness that helped the Eagles win their first NFL Championship in 1960 at Franklin Field, which is no longer there either. Unlike most NFL teams this week the Eagles have avoided the headlines. What better time to reminisce? Do you remember this video from the Buddy Ryan era? Anyone still have the words memorized? 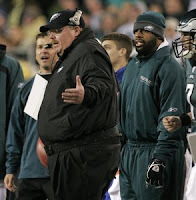 How about the the current Eagles doing a version for Andy Reid? Brian Westbrook - FINALLY Getting Recognition! In a recent ranking of running backs in the NFC, Sporting News ranks the Eagles' running backs as number two in the NFC. The Vikings were tops in the ranking. It is noted that Brian Westbrook is the "NFL's most dangerous all-around back." In the past, such a comment has been reserved for LT in San Diego. After years of battling for recognition, Westbrook is finally getting the much deserved spotlight. Will the 2008 season be the season when the Eagles' offense becomes a run first team? Maybe bring back the three headed running attack of years back? Could Booker, Westbrook, and Buckhalter be the new Staley, Westbrook, and Buckhalter? Philadelphia Phillies and Eagles: A Pitcher or a Wide Receiver? We know that the Phillies need pitching help. We know that the Eagles need more help at wide receiver. Who has the more pressing need? Looking at the make-up of the teams, it would seem the Phillies are in more dire need. Despite not having a true number one receiver, the Eagles still have a top flight quarterback (McNabb when healthy) and a dynamic running back (Westbrook). If the receivers can’t get open, just have McNabb put the ball in Westbrook’s hands for a big play. Westbrook can beat you with his legs and his hands. If the offense is struggling, the defense can carry the team. Cole, Patterson, Gaither, Sheppard, Samuel, and Dawkins are each leaders and stars at their respective positions. Defense wins championships. The Eagles have shown in the past they can win without a number one receiver. Remember Pinkston and Thrash used to be the go to guys. And during the Eagles run to the Super Bowl, the playoff games were won with Fred-Ex being the main target. The Phillies starting rotation has four starters with and ERA over 4, with two of the four carrying an ERA over 5. After Hamels, there are no pitchers that bring consistency from start to start. The offensive firepower of Rollins, Utley, Howard, and Burrell can carry the Phillies to a division title. But in the playoffs pitching is what gets a team to the next round. Look at last year’s playoff series loss to the Rockies. The offense was non-existent and the Phillies were swept in three games. The Phillies pitching could not carry the team. A more recent example is the back to back series losses to the Red Sox and Angels. The opposition boasted star pitching, the Phillies offense slumped, and the Phillies pitching could not counter. The Phillies need another top line pitcher to make an extended playoff run this year. Their need is greater than the Eagles. And I am the big off-season free agent signing for the Eagles offense. I am it. There will be no big name wide receiver coming to the Eagles. Only me, some Lawton guy, and Kris Wilson. It is time to stop the rumors about a number one receiver coming to the Eagles. The latest rumor has Marcus Colston (Saints) coming to the Eagles. It is not going to happen. Just me. - Improve the Eagles woeful scoring offense. In 2007 the Eagles ranked 17th in the NFL in scoring. 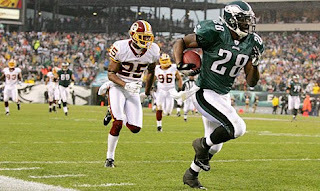 - Give Brian Westbrook some much-needed rest. Westbrook played in 15 games during the 2007 season. During those games Westbrook had 84 percent of the carries by Eagles running backs. 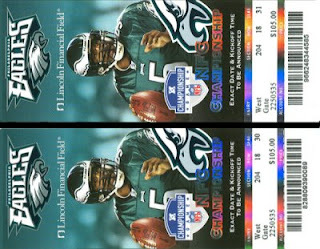 - Provide a boost to the Eagles anemic kick return game. - Unfortunately my only NFL experience was last year with the 1-15 Miami Dolphins. Despite Ronnie Brown’s injury, I managed only one start. - My stats…some good, some bad. 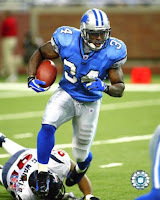 In 2007, I carried a 4.5 yards per carry average, but gained only 125 yards rushing. I also added 237 yards receiving, but had no rushing or receiving touchdowns. - I played my college ball at Florida State. My numbers were so good that the Eagles had plans on drafting me in the 2007 draft. They were too late and had to settle for Tony Hunt. - Blazing speed, great hands, and elusive. I have been compared to a guy named Brian Westbrook. - The plan is to use me in a lot of 2 man backfields with Westbrook. Maybe bring back some memories of the Charlie Garner and Ricky Watters backfield. - On third downs I will be spread out as a receiver for mismatches against a linebacker. - I will be your number 2 running back. Maybe the Bears would be interested in Bulkhalter? - I can guarantee that the 2008 Eagles will have more wins than my previous employer. The news out of Jacksonville is that Lito Sheppard will be at training camp. Sheppard states, "I'm just preparing myself to play, wherever that might be, but I'm going to be ready." Yes it is strange to list a backup offensive guard as an important cog on any team, but Jean-Gilles is at a crossroads in his career already. When Jean-Gilles was drafted he was a renowned masher, an inline run blocker that dominated at Georgia. It seemed inevitable to pair him with Shawn Andrews to create an imposing guard tandem for years. The problem is Jean-Gilles has issues with pass protection and has not progressed enough to usurp the position from last year’s starter, Todd Herremans. Jean-Gilles’ struggles has caused a major shake-up on the offensive line. The Eagles now have Winston Justice working at guard in practice, a position he has never played before. Has Jean-Gilles digressed so much that he is now considered a worse prospect than the man who single handily put Osi Umenyiora in the Pro Bowl last year? Jean-Gilles needs to begin to fulfill his promise soon. Otherwise he becomes yet another failed prospect at the offensive line position. Often overlooked in discussions of the Eagles secondary is how weak their safeties could potentially be. Considine has improved considerably since joining the Eagles but there is still little doubt that he is the weakest link in the secondary. Having Samuel, Brown and Sheppard at corner is useless if there is not competent coverage help over the top. Considine’s struggles prompted the drafting of Quintin Demps and led to speculation about possibly moving Sheldon Brown to the safety position. Moving Brown then diminishes the strength at corner. Let’s hope the speculation remains only speculation. There is already a logjam at the safety position with Dawkins, Mikell, Reed, Demps, and Paschal. Considine will have to improve and play well behind the Eagles’ corners to help solidify the back end. If not, he can forget about ever regaining his starting spot from Mikell. Or worse, keeping his roster spot. What can Brown do for you? It’s an important question this season for the Eagles as last year the answer was very little. The curious thing about last season’s struggles was that Brown was coming off of a strong 2006 campaign where he caught eight touchdown passes. If Reggie reverts back to his 2006 form, the Eagles receivers could approach decency. 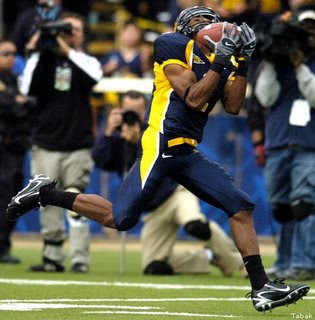 Kevin Curtis comes into the season looking to improve on his 1100 receiving yards and 6 touchdowns in 2007. DeSean Jackson brings much needed speed to spread the field. LJ Smith brings a weapon in the middle of the field. The missing element is consistency from Brown. Brown must improve for the Eagles offense to fire on all cylinders again in 2008. 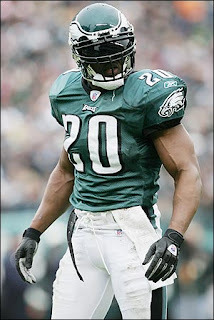 Brian Dawkins: Our Leader Has Returned! Thankfully there are charity golf tournaments. In addition to the obvious chartiable cause, today's Burn Prevention Classic allowed the fans to hear from Brian Dawkins. And all signs point to the return of big plays, nonstop adrenaline, and tenacious tackles. B-Dawk is back! Listening to Dawkins, one cannot help but get psyched for the upcoming season. Let the hitting begin! Dawkins noting what excellent shape he is in entering training camp. His foundation is back and there will be no burn-out or being a step behind in 2008. 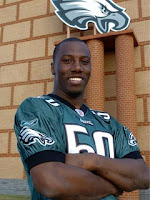 Dawkins has been working out since the day after the Eagles 2007 season ended. Dawkins is again ready to explode into runners. Not hit opposing runners, EXPLODE into them! Third down defensive packages will be bring HEAT on the opposition. Dawkins confirms the reports...DeSean Jackson can FLY! September 7, 2008 can't get here fast enough! As we begin the final countdown to the start of Football Season and the Phillies continue their race to who knows where, a mini sports controversy of sorts has developed. No, it’s not which of the teams, the Eagles or Phillies, has the best chances of ending our 100 season championship drought, or even which team has made the most of their trade opportunities. It’s, believe it or not, which team has the best tailgating! Now, despite the fact that this is a sports blog, usually reserved for serious discussions, by self proclaimed experts, of x’s and o’s and player stats, neither of which I can claim intimate expertise in, I do know more than a little about food and bbq and partying, both indoors and out. I’ve had many serious discussions with my buddies Jack Daniels and Johnny Walker. I’ve also been an Eagles Season Ticket Holder for the past 7 years. That’s not a lot of time, I guess, in the scheme of things for Eagles Season Ticket Holders, but it is enough, I think, to make some credible observations. Phillies tailgating vs Eagles tailgating. Come on. That’s like comparing your neighborhood block party to Woodstock (no, not the Peanut’s character). I’ve tailgated at Citizen Bank Park. Me and a few hundred others, enjoying a picnic on a summer day in our t-shirts and shorts, sitting on lawn chairs, grilling some hot dogs and throwing around a baseball. I’ve also tailgated at the Linc. Me and several thousand others. Many, despite freezing temperatures and inclement weather, in t-shirts and shorts, thanks to visits from Jack and Johnny and cousin, Bud. Many others, like me, in layers of clothing. 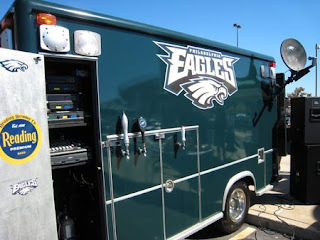 We are sitting on Eagles chairs, living room size sofas in front of stadium sized TV’s, and gathered around special Eagles buses and SUV’s, and we are cooking ribs and steaks, and pasta and crabs on almost commercial grade grills. With all the comforts of home, or at least their neighborhood Tap, some never even go into the stadium. And, the way the Eagles have sometimes played, that’s not necessarily a bad thing…but, I digress into something approaching real sports talk! To be fair about it, Phillies Fans are getting better. I don’t remember any tailgating at the Vet, and Football has a long tradition of tailgating. So, for a nice Sunday in the Park with a few friends, bring your grill to the Park. But, for a real tailgating experience, come on out to the Field. With the Eagles playing a home game this Thanksgiving, there is sure to be a real feast that day. Turkey dinners with all the trimmings right from the tailgate. A good off-season cut looks even better now. Former Philadelphia Eagle and current Tennessee Titan, Jevon Kearse was arrested on Sunday morning for a DUI. Kearse took a field sobriety test, but refused a breathalyzer. He was arrested and charged with DUI and violation of Tennessee's implied consent law for failing to take the breathalyzer test. It appears that Kearse hit the bottle harder than he hit opposing quarterbacks lately. Hey, maybe the front office does know what they are doing. Next we will find out that Reggie Brown is a #1 receiver! Randall Cunningham and Curt Schilling - Hall of Fame Bound? With Curt Schilling’s 2008 season being over (and possibly his career), this Philadelphia fan got to thinking about another Philadelphia great, Randall Cunningham. Curt Schilling and Randall Cunningham. Two ex-Philadelphia athletes whose career numbers put them on the cusp of the Hall of Fame. Does either player carry Hall of Fame credentials? Despite Schilling achieving the majority of his success away from Philly, he will always have a place in the hearts of Phillies fans. His 1993 playoff performance was one of the most dominant in team history. Cunningham had brief stints in Minnesota, Baltimore, and Dallas, but he made his mark as a Philadelphia Eagle. 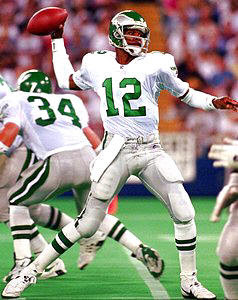 Say #12 to an Eagles fan and they say Randall Cunningham. Cunningham is a four time pro bowler and a four time all pro selection. Even more remarkable are Cunningham’s three MVP awards and his ranking as the NFL’s all time leading rusher at the quarterback position. The case for Cunningham begins to unravel when you look at his team's success. With the Eagles, Cunningham could never carry his Eagles past the second round of the playoffs. As a Viking his team crumbled in the NFC Championship Game against the Falcons. An argument could be made that Warren Moon also did not achieve great playoff success but was enshrined into Canton. A closer look at the numbers shows 49,325 passing yards and 291 touchdowns for Moon. Cunningham’s career numbers are 29,979 yards and 207 touchdowns. Moon ranks fourth all time in passing yards and sixth in touchdown passes. In the same categories, Cunningham ranks 30th and 24th all time. The numbers support Moon being in the Hall of Fame. Unfortunately the numbers do not support a similar fate for Cunningham. Cunningham revolutionized the quarterback position with his scrambling ability and freak athletic skills. Unfortunately his lack of team success (no Super Bowl appearances) and pure passing numbers will keep him out of Canton. Unlike Cunningham, Schilling achieved his greatest success in the post season. With the Phillies he claimed NLCS MVP honors in leading the Phillies to the 1993 World Series. During his time with the Arizona Diamondbacks and Boston Red Sox Schilling claimed three World Series titles. Without his clutch performances, the Diamondbacks and Red Sox would not have claimed their titles. Schilling posts an 11-2 post-season record, a World Series MVP, and an historic bloody sock performance against the Yankees. The Hall of Fame argument for Schilling weakens when you look at his numbers and the fact that he was not the dominant pitcher of his era. Schilling posts 216 wins, 3116 strikeouts, and a 3.46 ERA. These numbers, which earned him 6 all-star selections, were good but not great numbers. Good numbers resulted in zero Cy Young Awards for Schilling. Schilling ranks 14th all time in strikeouts, but only 79th all time in wins. Current pitchers Randy Johnson, Greg Maddux, Tom Glavine, Pedro Martinez and Mike Mussina are a few of the current pitchers posting better numbers. Both Cunningham and Schilling put up strong numbers to support a Hall of Fame selection. Unfortunately it looks like both athletes will come up short in their quest for enshrinement. McNabb's shoulder injury has given him some free time, maybe too much. Speaking to a local NY reporter, McNabb provided his thoughts on the drama surrounding the New York Giants. The Shockey and Burress feuds stir up memories of the Owens saga. The Giants should worry about teammates taking sides and a divided locker room. The Giants could learn from McNabb's situation and realize the need for strong leadership to avoid a potentially explosive situation. Michael Strahan is a first-ballot Hall of Famer. Maybe tomorrow McNabb will provide his thoughts on the Iraq War and the struggling economy. 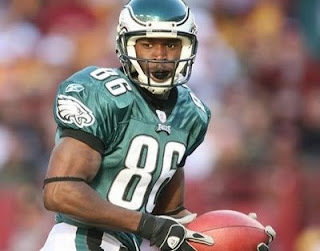 The reports that former Detriot Lions WR Charles Rogers will be trying out with the Philadelphia Eagles are FALSE. The false report stems from his old High School football coach making claims that several teams have expressed interest in Rogers and will bring him for a tryout. 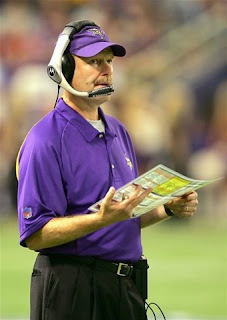 The other team rumored to be interested in Rogers was the Minnesota Vikings. Again a false rumor as all reports state the Rogers has NOT been brought in for a try out with the Vikings. Unfortunately, it looks like Curtis and Brown are safe! On the flip side they are probably improvements over Rogers. Sean Considine: The Next Mahe or Detmer? 2008 looks like the year that Reno Mahe is finally gone (PLEASE DeSean Jackson catch the punts!). 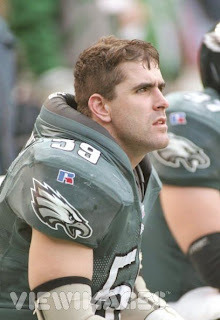 Prior to Mahe's departure, the Eagles were able to say goodbye to holding specialist Koy Detmer. Please let Considine be the next Eagle to depart. One of the few training camp battles will be at the safety position. There are currently 6 safeties on the Eagles roster. Dawkins, Demps, and Mikell should be locks to secure roster spots. If the Eagles carry 4 safeties, can Considine beat out J.R. Reed and Marcus Paschal? Yes to Paschal and hopefully NO to Reed. Reed showed consistency, hard hits, and decent coverage ability during his 3 starts last year. Before his shoulder injury Considine showed poor tackling and a knack for blowing coverages. In eight starts Considine posted 36 tackles and 1 interception. In 3 starts Reed posted 31 tackles and 1 forced fumble. Considine does bring experience, but with Dawkins back how much does that matter? Reed brings versatility with his ability to return kick offs. How effective can a safety be retuning from a serious should injury? Lets hope we don't get to find out. Andy, make it 3 goodbyes and get rid of Considine. Maybe the Vikings would be interested in another Eagles castoff! Memo to Joe Banner and Andy Reid: Chad Johnson's ankle surgery was a success on Wednesday. Eagle fans did not want to let the injury prevent trade talks from possibly rekindling. 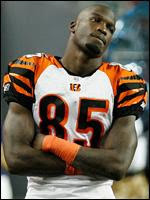 All reports say that Chad Johnson will be ready to go when training camp rolls around. So please go locate Lito Sheppard and package him and some draft picks for Johnson. Training camp is still a month away...it's not too late! Please don't believe Dave Spadaro that Kevin Curtis is a #1 receiver. The Minnesota Vikings To Win the Super Bowl? SI's Dr. Z has labeled the Minnesota Vikings as the favorite to win this year's Super Bowl. Did the Philadelphia Eagles hold onto the wrong coach by keeping Reid and letting go of Childress? 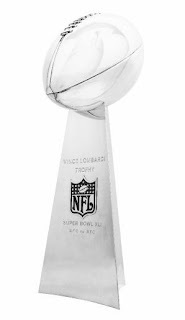 Though I don't believe that the Eagles will be hosting the Lombardi Trophy this year, there is no way the Vikings are claiming the title. Last time I checked Tarvaris Jackson is still the starting quarterback and Childress is a Reid coaching disciple. So even if the Vikings manage to get to the Super Bowl (which they won't), we can count on a Reid-like coaching startegy to lead the opposing team to victory. Former Cardinal O'Hara standout and Detriot Lions running-back Kevin Jones is making a quick recovery from his knee injury. Reports have Jones being able to take part in non-contact drills at training camp. What training camp will that be? Reports have the Eagles, New England, Chicago, Green Bay, Tennessee, Tampa Bay, Denver, Kansas City, Buffalo and the New York Jets showing interest in adding Jones. Unless Jones can play receiver, don't plan on a Philadelphia reunion. It would be worth keeping an eye on Jones throughout the year and how his numbers compare to Lorenzo Booker. Eagle Fans Be Thankful You Are Not a Giants Fan! First Michael Strahan retired. Then Jeremy Shockey yelled at the General Manager. And then Plaxico Burress announced he would not be playing without a new contract. And now we find out...running back Ahmad Bradshaw is serving a 30-day jail sentence on a probation violation in southwest Virginia. Bradshaw reported to jail on Sunday. Are the Philadelphia Eagles Linebackers Too Young? The Eagles currently have 8 linebackers on their roster. Combined, the 8 players have 8 years of NFL experience! Rocky Boiman, a journeyman back-up, leads the group with 6 years of NFL experience. Unfortunately his career high in tackles is 54. The Eagles better hope that none of the starters go down with an injury. The projected starters at linebacker are Stewart Bradley, Omar Gaither, and Chris Gocong. Combined the starters have 4 years of NFL experience. Bradley the starting middle linebacker has 1 career start. That is not a typo, 1 career start. An important reserve will be Akeem Jordan. Jordan too is short on experience, having only 1 year of NFL experience and 1 career start. The other reserves include Joe Mays, Justin Roland, and Andy Studebaker. Each player is a rookie, making their combined NFL experience 0 years! Is it too late to bring back Takeo Spikes? - The Eagles trade OT Winston Justice to the New York Giants. Justice is inserted opposite Trent Cole. Trent Cole records an astonishing 13 sacks in two games against the Giants. - The Eagles continue their busy off season and trade their number one picks for the next ten years to the Cincinnati Bengals for Chad Johnson. Hey, when was the last time the Eagles used a first pick anyway! - Philadelphia’s Missing Persons Unit is able to locate Lito Sheppard. - James Thrash is anointed the Washington Redskins number one receiver. Donovan lobbies for a trade to the Redskins to be reunited with his former number one. - Dallas passes an ordinance to keep strip clubs open 24/7, 365 days. Pacman Jones fails to show for the Cowboy’s first 16 games. - Desean Jackson goes through an unexpected growth sport and reports to training camp at 6’2’’ and 215 pounds. - Eagles finally cut Reno Mahe, Greg Lewis, and Darren Howard. Each player is immediately signed by the Minnesota Vikings. - McNabb goes down with an injury in Week 1. Feeley is traded to the Buccaneers for Jeff Garcia. Garcia doesn’t lose a beat leading the Eagles offense. - It is 3rd and inches and the Eagles actually run the ball. - It is first down and the Eagles actually run the ball. 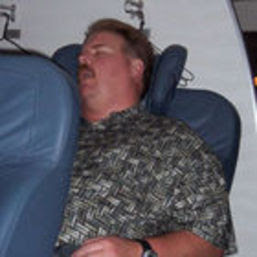 - At a post-game press conference Andy Reid gives the usual “I need to do a better job” response. But this time he actually does a better job. - Tra Thomas and Juqua Thomas actually decide on a name. William Thomas and Juqua Parker actually decide on a name. - Andy Reid gets new batteries for his watch and his time management skills miraculously improve. - Lito Sheppard turns out to be the Eagles best receiver. - The New York Giants trade Winston Justice to the Washington Redskins. Justice is inserted opposite Trent Cole. Trent Cole records an astonishing 13 sacks in two games against the Redskins. - The end zone at Lincoln Financial Field is moved up 20 yards. The Eagles red zone problems are no more. - The Washington Redskins trade Winston Justice to the New England Patriots. Justice is inserted opposite Trent Cole. Trent Cole sacks Brady an astonishing 7 times. - Eagles lose the Super Bowl. Come on, it’s Philadelphia of course we are going to find a way to blow it! Is Matt Jones or Terry Glen the Answer at WR for the Eagles? Curious if the Eagles would have any interest in Terry Glen or Matt Jones if they became available? Glen's injury history might scare off the Eagles, but adding a veteran receiver with his skill set can only improve the Eagles mediocre receiving core. Even with bum knees he is probably still faster than all of the Eagles WRs, except DeSean! 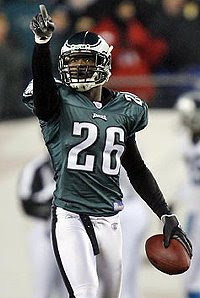 The Eagles showed interest in Jones during the 2005 NFL draft. Though his NFL career has been a disappointment to date, his freak athletic skills might make him a good red zone target. Either addition would mean we could finally say goodbye to Greg Lewis! Correll Buckhalter to the Chicago Bears? When final cuts roll around the Eagles are going to have to make a difficult decision at running back. The off season addition of Lorenzo Booker makes Booker the logical choice to be the number two running back behind Westbrook. The Eagles would look foolish to already give up on last year's third round pick Tony Hunt. And Hunt provides size for short yardage situations. With this scenario is Buckhalter expendable? And if so, would would make a good trading partner for the Eagles? How about trading Buckhalter to the Chicago Bears for draft picks. After cutting Benson, the depth chart at RB for the bears is Adrian Peterson and rookie Matt Forte. Last year the Bears ranked 30th in rushing yards per game. Going into the season Peterson is their #1 back with 510 yards last year. Buckhalter would make sense for the Bears and would allow the Eagles to capitalize on a position of strength. McNabb does not foresee a big rookie year from DeSean Jackson as rookies don't make plays and don't start for the Eagles. While this maybe true, would it have hurt to throw the guy a compliment? McNabb was not overly excited with the addition of Asante Samual. Donovan stated that the Eagles really didn't need to address the secondary. Sounds like a jealous offensive player! McNabb also appears to not be overly excited with his current receivers, noting he would welcome the addition of Chad Johnson. I guess McNabb forgot how great his last relationship with a flamboyant, me-first receiver went. Of course Donovan also talked about how scrutinized he is in the city. He even went so far as to say that nobody in the NFL over the past 10 years has been scrutinized as much as him. So in short, just another typical whoa is me McNabb interview. In case Dave Spadoro has permanently turned you off from visiting the Philadelphia Eagles website, Eagles single game tickets go on sale tomorrow morning (June 19) at 10:00am EST. You might as well save yourself the aggravation and skip the sale. Past history shows that tickets will be sold out a few seconds after 10am. The smart bet is to just hit up ebay for tickets. If you still want to give it a shot I hear that calling an out-of-state Ticketmaster phone number will allow you to get passed the constant busy single on the Philadelphia area number. Here's a past article regarding the waiting list for season tickets to our Eagles. I guess one team's garbage is another teams starting defensive tackle. The San Francisco 49ers announced that they have claimed defensive tackle LaJuan Ramsey off waivers. Ramsey was cut by the Eagles following the conclusion of last week's mini-camp. Ramsey was once considered a late round draft steal steal by the Eagles. Unfortunately the more the team saw of Ramsey they figured out why he was still available in the 6th round. He was active for only nine games last season, sitting for the final four. Here's hoping that Trevor Laws lives up the hype and provides better relief for Bunkley and Patterson. Today’s news of Terry Glenn’s absence from Cowboy’s mini-camp got this Eagles fan thinking. I can’t believe I am going to write this—Is it possible that the Eagles have the best set of wide receivers in the NFC East? Yes, the much maligned Eagles receivers are tops in the division. Need some convincing? 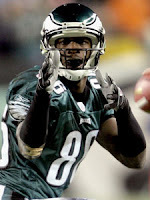 In 2007 the Eagles top-three wide receivers (in terms of statistics) were Kevin Curtis, Reggie Brown, and Jason Avant. Together the trio posted 161 receptions, 2157 receiving yards, and 12 touchdowns. In 2007 the Redskins top-three wide receivers were Santa Moss, Antwaan Randle El, and Keenan McCardell. Together the trio posted 134 receptions, 1792 receiving yards, and five touchdowns. In 2007 the Cowboys top-three wide receivers were Terrell Owens, Patrick Crayton, and Sam Hurd. Together the trio posted 150 receptions, 2366 receiving yards, and 23 touchdowns. In 2007 the Giants top-three wide receivers were Plaxico Burress, Amani Toomer, and Sinorice Moss. Together the trio posted 150 receptions, 2010 receiving yards, and 15 touchdowns. The numbers show the Eagles leading in receptions and second in receiving yards and third in touchdown receptions. Better than you probably thought, but the argument needs to be stronger. When looking at the 2007 numbers you must take into account that both the Giant and Cowboy receivers had their starting quarterback (Manning and Romo) starting all 16 regular season games. 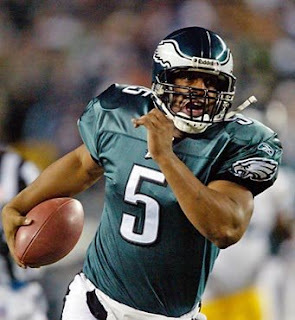 Donovan McNabb started only 14 games and missed time in another game. The Eagles receivers had A.J. Feeley (this year’s third string quarterback) throwing them passes for two-plus games. It is not hard to argue that the Eagles receivers would have posted better numbers with McNabb starting all 16 games. Also, McNabb entered the season at less than 100 percent health. Again, don’t you think McNabb’s health lessened the effectiveness and numbers of the Eagles receivers? The Cowboys, Giants, and Redskins each had a dominant tight end on the field to draw coverage away from the receivers. Cooley, Whiten, and Shockey (for 14 games) had to be accounted for on the field. Bringing a double-team to the receivers becomes more difficult. 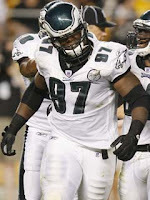 The Eagles had an injured and ineffective LJ Smith in 2007. A healthy Smith draws similar defensive coverage, freeing up the receivers on the outside. Less coverage again would have lead to better numbers by the wide receivers in 2007. Entering the 2008 season, which set of receivers looks most promising? Again, the answer is the Eagles receivers. The Cowboys will enter the season with Owens and Crayton again being their top two receivers. It seems that Glenn will not be returning to the Cowboys as he is refusing the team’s $500,000 contract guarantee. There is no argument on Owens being a top receiver, a future Hall of Famer, the division’s most dominant receiver. The effectiveness of Clayton diminished as the 2007 season progressed. By season’s end Crayton was known more for running his mouth than his play on the field. The Giants will most likely enter the season with Burress and Toomer being their top receivers. Steve Smith, coming off of a strong Super Bowl performance, could challenge for the number two position. Burress is currently a camp hold-out as he pushes for a new contract. Will his contract demands be met? If he enters the season without a new contract, will his play suffer as a result? Toomer enters the season another year older and Smith enters the season with eight career regular season receptions. Moss, Randle El, and rookies Devin Thomas and Malcolm will battle for the top receiving spots. Can Moss make it through a season with out injury? Can Randle El and the rookies master the complexities of Zorn’s West Coast offense? Can an inconsistent Campbell get the ball to them enough to be effective? Too many questions surround the Redskins receiving core. And we can’t forget the Redskins still have James Thrash on their team. That fact alone speaks volumes about the quality of the Redskins wide receiver position. The Eagles enter the season with two established veteran receivers leading the way. Curtis will be entering his second year in the system. In college and with the Rams, Curtis showed significant statistical increases from year one to year two. Brown will be entering his fourth year in the Eagles system. His numbers have increased from each of the previous years. During an inconsistent 2007 season he was still able to post a career high of 61 receptions. Desean Jackson will also have an impact on the success of Brown and Curtis. Jackson brings speed to the WR position and will stretch the field. The deep ball will again be a weapon in the Eagles offense. Brown and Curtis will be able to roam the middle more freely and increase their yards after catch numbers. You might find faults in my argument that the Eagles are the division's best, but the reality is that the Eagles wide receivers are not as bad we think. But if for some reason a Chad Johnson or Mike Williams becomes available…well you can ignore my babble. 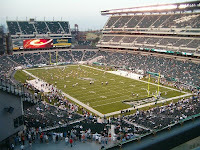 On Sunday, Sept. 7, the Philadelphia Eagles will begin the 2008 season. 53 players will take the field for the Eagles, and several questions remain as to which players will make up the 53-man roster. Currently, the roster stands at 80 players after last week’s cuts. Looking at the positions below, and current roster numbers, some of the cuts could be tricky. - The Eagles will carry three quarterbacks into the season. - The Eagles will carry four running backs into the season. The previous struggles of Moats will make him the odd man out. 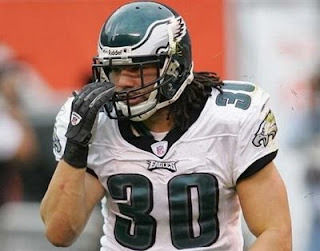 - The Eagles will carry one fullback into the season. Jason Davis’s experience in the system makes him the leading candidate. - The Eagles will carry six receivers into the season. Brown, Curtis, Avant, Baskett, Lewis, and Jackson should make the cut. - The Eagles will carry three tight ends into the season. Smith, Celek, and Schobel make the cut. Wilson’s inability to consistently catch passes will be his downfall. 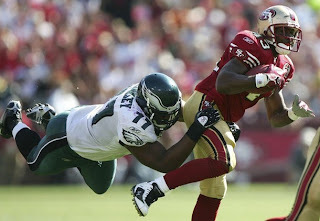 - The Eagles will carry three tackles into the season. Dunbar and Dunlap's best opportunity will be spots on the practice squad. Having Justice learn and practice the guard position gives him the nod. - The Eagles will carry four guards into the season. Andrews, Herremans, Jean-Gilles, and McGlynn make the cut. McGlynn’s versatility at the tackle position gives him the nod. - The Eagles will carry two centers into the season. Cole is a dependable backup behind Jackson. - The Eagles will carry five defensive ends into the season. Cole, Howard, Abiamiri, Clemons, and Parker are your pass-rushing threats. Howard’s versatility in playing the tackle position allows him to stick around. A year on the practice squad will allow Smith to bulk up and learn the DE and LB positions. - The Eagles will carry five defensive tackles into the season. Klecko is too undersized to contribute at the tackle position. 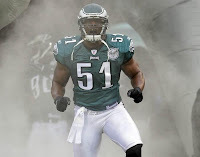 - The Eagles will carry five linebackers into the season. Cocong, Gaither, Bradley, Jordan, and Boiman make the cut. - The Eagles will carry five cornerbacks into the season. Arrington and Fontenot will be searching for work, while Ikegwuono will spend the season on injured reserve. - The Eagles will carry four safeties into the season. Dawkins, Mikell, Demps, and Reed make the cut. Considine’s injury history will make him the final roster cut. Can these 53 players carry the Eagles back to the top of the NCF East, or does another season of mediocrity await the Eagles' fans? Where is the problem? Why the attitude? We are constantly reading about the many reasons why the Philadelphia Eagles should trade Lito Sheppard. We are constantly reading comments from the players on how the current situation at cornerback is bad for the team and unfair to Lito. Why can’t we all just get along? The last time I checked, the city of Philadelphia was celebrating 100 seasons (25 years) without a championship. The last time I checked, the Eagles have missed the playoffs two of the past three seasons. Keeping Lito could reverse these trends. The NFL is a pass-happy league. The Eagles’ top division rivals, the Cowboys and the Giants, boast up-and-coming star quarterbacks and top-notch receivers. 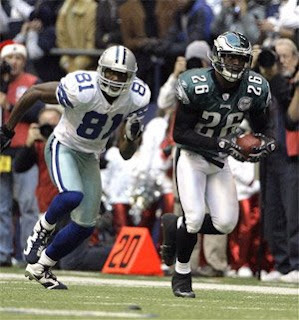 The Eagles finished the 2007 season near the bottom of the league in generating turnovers. Outside of Trent Cole, the Eagles had difficulty generating pressure on the quarterback. Keeping Lito in a secondary with Brown and Samuel negates the strengths of the Cowboys, the Giants, and the entire NFC. Keeping Lito gives the Eagles two of the league’s top interception producers. Keeping Lito leads to more “coverage” sacks. Lito complains that he is being underpaid. When looking around the league and recent cornerback contracts, this may prove true. However, the stats show Lito Sheppard having difficulty staying on the field due to various injuries (13 games missed over the past three seasons). With Lito’s injury history and games missed, his current contract doesn’t seem all that unfair. If Lito wants a new contract then he should earn it this year…stay on the field and produce! A big 2008 increases Lito’s trade value and the likelihood that a new team would give him the big money contract he seeks. Keeping Lito also gives the Eagles options that weren’t present in the past. The numbers show teams use a three-cornerback package nearly 60 percent of the time. The Eagles' nickel package would now boast three “starters.” The much-improved Hanson would become the team’s fourth cornerback. With Dawkins coming back from an injury-plagued season, keeping Lito gives the Eagles the option of moving Brown to safety if his injuries continue. Using Brown keeps Considine off the field! All offseason, players and fans have voiced their desire for the team to acquire more playmakers. If Lito stays, the need is lessened. Lito already is a playmaker on defense (Lito was the first player in NFL history to have two interception returns of more than 100 yards). If recent rumors are true, Lito could be bringing a dynamic, elusive element to the team’s weak receiving core. If DeSean Jackson, a rookie, can’t handle the return duties, Lito can take over punt return duties. Using Lito keeps Mahae off the team!